This set of Guided Notes accompanies the PowerPoint of the same title. If you like what you see here, keep in mind you can get ALL of the materials in Unit 14 by buying the Unit 14 Bundle. Just search for it in my Store. You spend less if you buy the Bundle! Packet includes comprehensive yet compact paragraphs summarizing key data. Worksheet includes space for students to write their answers right on the page. Each worksheet is complete with images for visual learners and multiple reading comprehension questions. Reading comprehension worksheet on key events in Global/World History. Packet includes reading comprehension questions, important information from the textbook, pictures for visual learners and practice exam questions. 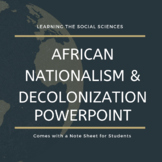 Crash Course World History #40- Decolonization and Nationalism Video Analysis- This is a 12 page document that contains a video analysis assignment and a completed teachers key for easy marking. 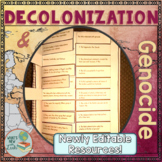 It contains 31 questions based on The Crash Course World History video: Decolonization and Nationalism. 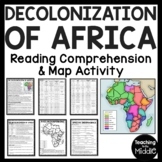 This is a cooperative learning activity in which students are assigned a country and roles to produce a newspaper during the decolonization period of their assigned country. The assignment is very specific, detailed, and provides a clear rubric. Crash Course Decolonization and Nationalism Ep. 40 If you are looking for a full semester of WORLD HISTORY try my FIRST SEMESTER OF WORLD HISTORY Here is what is included in this 6 page download: 1. Note Taking Guide for Students: This is essentially a blank section to take notes in. 2.